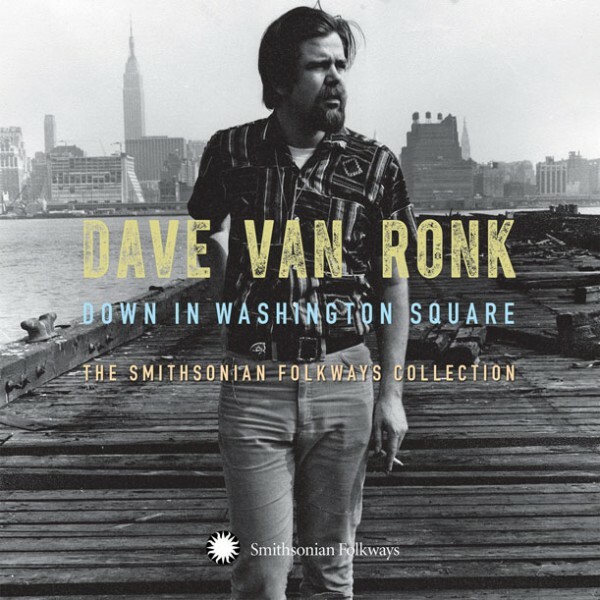 The booklet to the sprawling, three-disc Down in Washington Square: The Smithsonian Folkways Collection describes Dave Van Ronk’s guitar technique – the right thumb keeping time like on a piano, while the other fingers pick out melodies and harmonies – and claims in a quote attributed to the late folk singer that “if you can do this, you don’t need a band.” That sentiment underlines the 54 tracks collected here. Outside of backing vocals on a handful of a cappella sea shanties and the rare second guitar, the career retrospective consists only of the singer and his guitar and underscores his knack for taking passed-down songs and infusing them with his own personality. That large personality is what made Van Ronk a central figure in the ’60s Greenwich Village scene and folk song revival, and that influence found its way fellow folkies like Phil Ochs, Suzanne Vega and Bob Dylan. There’s an anecdote in the Dylan documentary No Direction Home that’s repeated in the booklet here about how the emerging singer learned his version of “House of the Rising Son” from Van Ronk, and how Dylan asked Van Ronk if he could record it. Van Ronk said that he’d rather Dylan didn’t since he had his own plans to record it soon. The problem was Dylan had already recorded it. Van Ronk said he had to stop performing it live because people thought he was ripping off Dylan, but eventually they both had to stop after people thought they were ripping off The Animals. “Rising Sun” is included here, along with a host of other songs that have appeared and reappeared in one version or another in various places by other singers (Nirvana fans will recognize “In the Pines” as “Where Did You Sleep Last Night”). Originals and previously unreleased material are interspersed throughout, but Down in Washington Square emphasizes Van Ronk the re-adapter and rearranger, showcasing his knack for interlacing folk standards with jazz inflections or a bluesy cadence. And while Van Ronk’s limited full-band output is absent, the collection spans from some of his earliest recordings in the late ’50s to live recordings from 2001, months before he died unexpectedly during post-operative colon cancer treatment. With its song-by-song notes, detailed booklet and the sheer breadth of material, Down in Washington Square makes a strong case for being the definitive Van Ronk collection.